President Barack Obama signed a memorandum in May directing the EPA and National Highway Traffic Safety Administration to co-write the first-ever fuel-efficiency standards for medium- and heavy-duty trucks. The Obama administration is preparing to release details of proposed fuel-efficiency standards for medium- and heavy-duty trucks that would begin in 2014 and extend through 2018, according to a published report. In May, President Barack Obama signed a memorandum directing the EPA and National Highway Traffic Safety Administration to co-write the first-ever fuel-efficiency standards for medium- and heavy-duty trucks. "I believe it's possible in the next 20 years for vehicles to use half the fuel and produce half the pollution that they do today," Obama said at a White House ceremony at the time. Margo Oge, director of the EPA's Office of Transportation and Air Quality, said an announcement would happen “soon,” The Detroit News reported today. The newspaper said details could be released as early as Monday. Because heavy-duty trucks account for a large percentage of emissions -- the heaviest consume more than 2 million barrels of oil every day, average 6.1 mpg and emit 20 percent of the greenhouse gases from the transportation sector -- the new proposal could reduce greenhouse gas emissions by 250 million metric tons over five years, The News reported. The proposal covering medium- and heavy-duty trucks is part of a larger White House initiative that includes standards for more fuel-efficient cars and light-duty trucks, including a 62 mpg fuel economy standard for light-vehicle fleets by 2025. 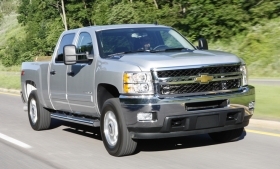 Current rules require a fleetwide fuel-efficiency average of 34.1 mpg by 2016 for passenger cars and light-duty trucks. Under the new medium- and heavy-duty truck rules, manufacturers would be encouraged to replace old diesel engines with new, cleaner diesels. The government already has spent $200 million on the effort since 2005. New diesel engines emit 90 percent fewer environmental pollutants, including those that contribute to smog, compared with engines made 20 years ago, Reuters reported.